Ladbrokes Australia launched in 2013, making it one of Australia’s newest sports betting agencies. However, Ladbrokes certainly have plenty of experience in the bookmaker market as Ladbrokes is a long established and much trusted sports betting company based in the UK. Being one of the biggest sports books in the world, Ladbrokes' acquisition of Bookmaker.com.au and entering into the Australian sports betting market was welcomed due to their focus on horse racing, their great sports betting markets and their efficient service and customer support. Find out more about Ladbrokes Australia in our full Ladbrokes Australia review. As soon as you load up Ladbrokes.com.au, it is clear there is a focus on betting on Australian horse racing. Their trademark logos are of a talking horse or the 'lads' - a group of punters you will recognise in yourself or certainly in your friendship group. If you see the promos, the horse and lads are often holding a smart phone with the Ladbrokes logo, so there is also no doubt that Ladbrokes Australia have a strong focus on modern betting via the Ladbrokes iPhone / Android app. 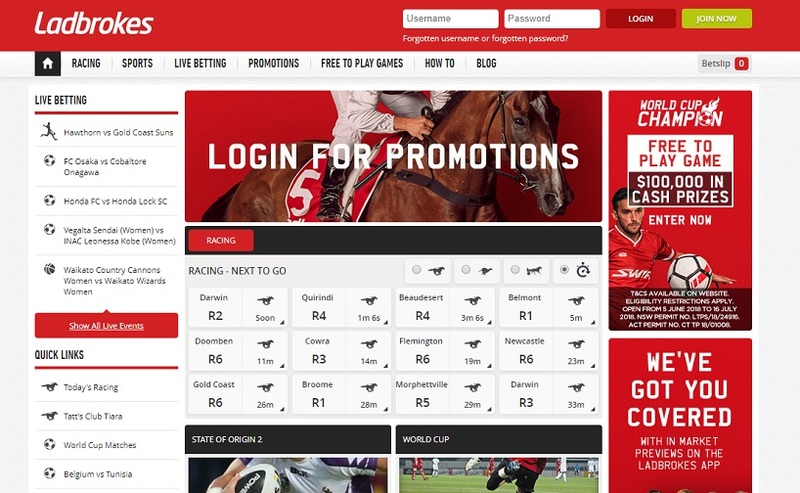 The betting navigation menu on Ladbrokes Australia will be very familiar to those who have bet on Bookmaker.com.au before. The main menu is broken up into four sections: ‘Racing’, ‘Sports’, ‘Novelty’, ‘Promotions’. This system is very easy to navigate, especially for finding horse racing meetings and quick access to each race on any given racing card. The graphics to navigate from thourghbread racing to Harness and greyhound racing is also great. Ladbrokes Australia is certainly one of the clicker looking Australian sports betting agencies. Ladbrokes are certainly among the best Australian betting agencies for horse racing, with a wide range of features, excellent coverage of betting markets and very competitive odds. Ladbrokes Australia excels in its simplicity. Depositing and withdrawing is made very easy and the betting account functions are laid out in an easy-to-understand manner. Punters will be happy to find it easy to take out their winnings and aren’t run around in circles when doing so. Ladbrokes Australia also has a reputation for paying out winning bets quickly, especially in horse racing where they immediately “Pay on Interim Dividends”. In addition, Ladbrokes Australia also pays out on both the interim winner and the official winner even if there is a protest and it is upheld. Ladbrokes Australia perhaps don’t offer as many sports betting options as some of the other Australian sports betting agencies out there, but they certainly excel when betting on Australian horse racing. Their promotions are often great, but again, they often focus on horse racing more than other sports. Ladbrokes Australia were also the first Aussie sports betting agency to offer a visa card which is connected to your account. Punters who have the Ladbrokes ATM Card, which is free, ​are able to instantly withdraw their winnings from any ATM where Visa is accepted, or alternatively, can use the card at any store that has Eftpos facilities. Have a win on the punt, then buy a round of beers, pay for your petrol on the way home and pick up the groceries - all paid for with your Ladbrokes Card! Another feature the site launched in 2015 was the Ladbrokes 'Cash In' which allows punters the ability to deposit funds with using cash in person at hundreds of newsagents around the country. Aspects like the Ladbrokes ATM card and the 'Cash In' show that Ladbrokes Australia are extremely keen to offer cutting edge features in Australian sports betting. These innovations aren't likely to slow down with Ladbrokes proving they are committed to staying ahead of the curve. If you sign-up to Ladbrokes Australia through Before You Bet you will be able to scoop a massively enhanced $500 bonus! If you go straight to Ladbrokes you will only be greeted with a $100 bonus, but if you sign-up through our links, you can score the enhanced $500 in bonus bets! NEW CUSTOMERS ONLY. EXC NSW, SA, WA & VIC. TURNOVER REQUIREMENTS APPLY. PROMOTIONAL T&CS APPLY & AVAILABLE ON WEBSITE. To claim the full Ladbrokes Australia bonus, punters must make a first bet of $500 and then that amount will be 100% in bonus bets. If the first bet is less than $500, then Australian sports bettors will still simply receive 100% of their first bet amount. So this offer is great for all punters, regardless of how much you want to bet! The great thing about the Ladbrokes Australia $500 bonus bet match is that the bonus terms are far more flexible than most other online sports betting sites. Terms and Conditions: Ladbrokes Australia bonus bets can be used on any selection with a dividend over $1.50. There can only be one bonus bet per race or event and it must be placed on a fixed odds market. Be sure to check out the full terms and conditions of the Ladbrokes Australia deposit bonus at their website before making any deposits.